By looking closely at the multilingual democracies of India, France and the USA, Harold F. Schiffman examines how language policy is primarily a social construct based on belief systems, attitudes and myths. 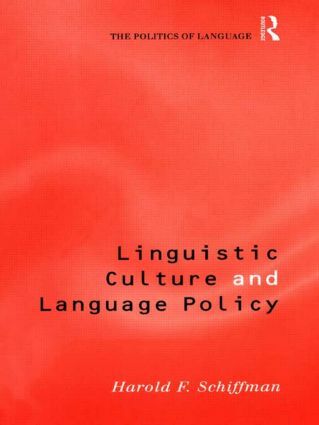 Linguistic Culture and Language Policy exposes language policy as culture-specific, helping us to understand why language policies evolve the way they do; why they work, or not; and how people's lives are affected by them. These issues will be of specific interest to linguists specialising in multilingual/multicultural societies, bilingual educationalists, curriculum planners and teachers.